That’s what my mentor often says. And that goes for blog posts, podcasts, landing pages and videos. Why use calls to action? You’ve worked hard to script and produce the video. You’ve spent even more time editing and optimizing it. And your audience were drawn to watch it. So now what? What’s the next thing you’d want your audience to do? You do want him to take an action, don’t you? The call to action is an active invitation to your audience to interact with you. It is a gentle prompt for them to take the next logical step after watching your tutorial video. Contrary to what many believe, getting your videos to go viral is not your primary objective. It’s great when they do go viral but what is more rewarding is to have your videos bring you visitors (traffic) who are really interested in your service or product (leads). One way to do that is to present them with clear call to actions at the end of your videos. But how, you ask? Although you can easily add a link or an email capture form at the end of blog posts, you can’t do this with a video. YouTube attempt to overcome this with annotations. These are the short pop up messages you see as the video plays. These messages can have live links the lead to landing pages or associated websites. Very handy for lead generation. With bigger smartphone screens and faster network connections, video consumption on hand held devices has proven to be very popular. YouTube’s statistics reports that half the people accessing YouTube videos are doing so on mobile devices. Yes, that means half your YouTube Video audience won’t see your annotations. Ouch. And if you upload the video to other video hosting platforms like Vimeo, Viddler or Facebook, the hyperlinks associated with the annotations won’t work. This defeats the purpose. YouTube recently introduced interactive cards which works like the annotation but only better. However, these callsto actions interactions cards only work on the YouTube and Google Plus platform. 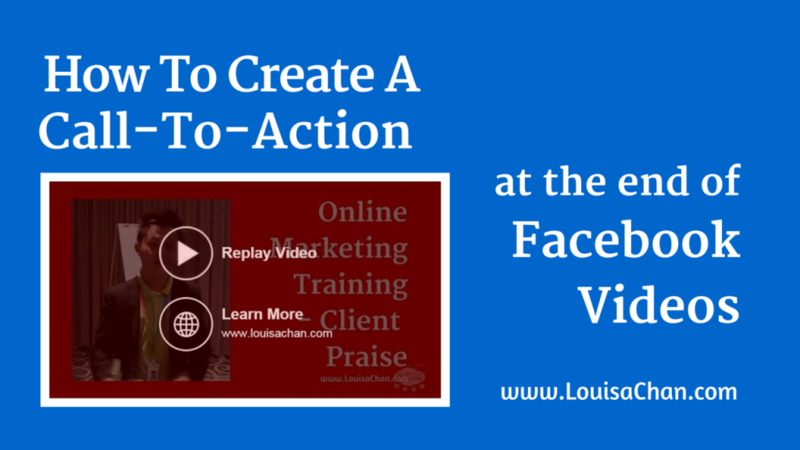 What if you want to upload your video to Facebook, will you be able to end your video with a strong call to action there? Fortunately, Facebook too has it’s own interactive call to action feature for native videos. These are videos that are uploaded to Facebook and not shared with a link to YouTube. This video tutorial shows how you can end your native Facebook videos with a clear call to action. If you’d like to see how this works in Facebook you can watch the original native Facebook video here. Note that the options you have for the call to actions and how they show up at the end of the video. As you can see, this is still early days for video interactivity. Although both YouTube and Facebook are offering call to action features, there are limited actions to choose from and you can’t customize them. But this is a good start. Whatever platform you use, it is important to place clear calls to action in your copy and your videos. Lead your audience to a desired action. Bring them home into your sales funnel.